Happy New Year 2015! Hope you all had some fun and the beginning of this year has been lovely so far. As it’s once again a new year, I should probably talk about new beginnings, intentions and goals, eating more greens, getting fit or starting a cleanse or a detox. Instead of all that, I decided to do things a bit differently this time and start the year with some chocolate, if you don’t mind. Just because there should be something to eat for all of us who haven’t got those intentions and goals figured out and written down to our new notebooks. 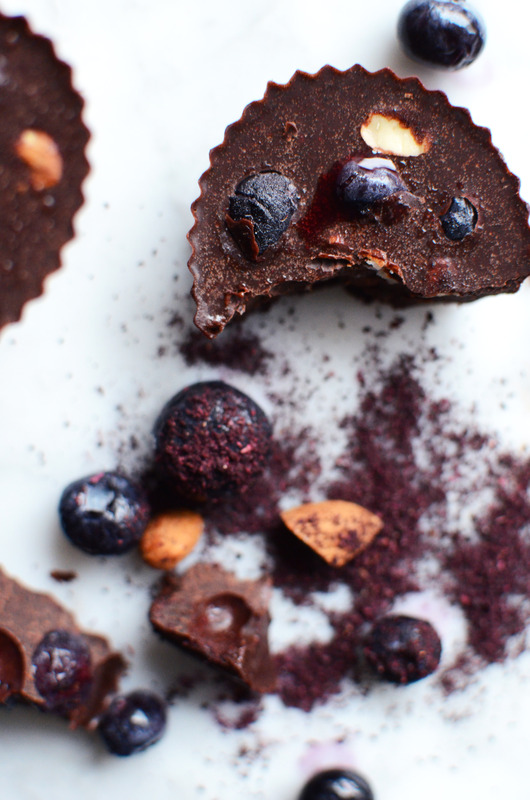 And ’cause those intentions and goals that we are thinking of say nothing about quitting chocolate…especially if we’re talking about these Raw Almond & Blueberry Chocolate Treats that I made for you! I wouldn’t describe myself as a fanatic chocolate lover but lately I’ve noticed that chocolate is a rather efficient little thing when a sweet craving hits me. And when I noticed that it takes less time to make my own chocolate than to run to the store, chocolate started to become a regular thing in our kitchen. I usually make chocolate in the spur of the moment without a recipe. 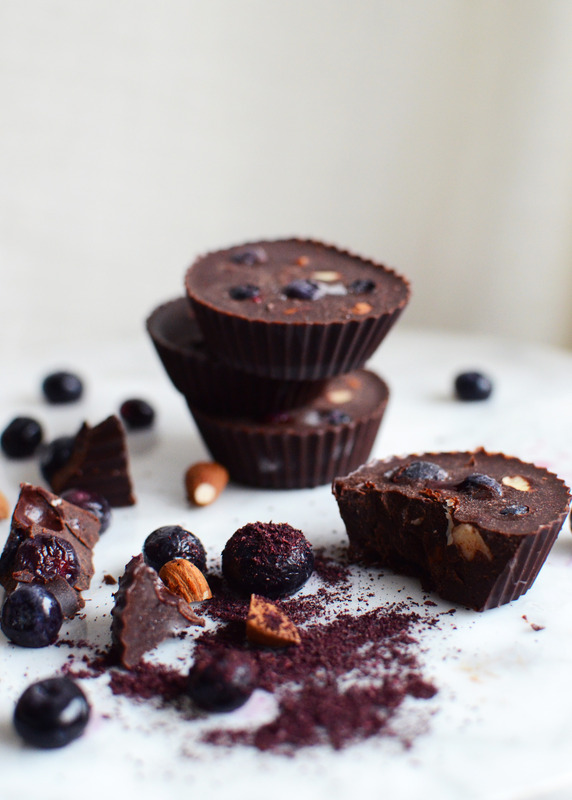 It’s so easy to add different kind of flavors to the basic ingredients (cacao butter, coconut oil, honey and cacao powder) and all kinds of nuts, dried fruit and essential oils are my favorite. This time I decided to try berries with chocolate and it turned out to be a quite fun combination. 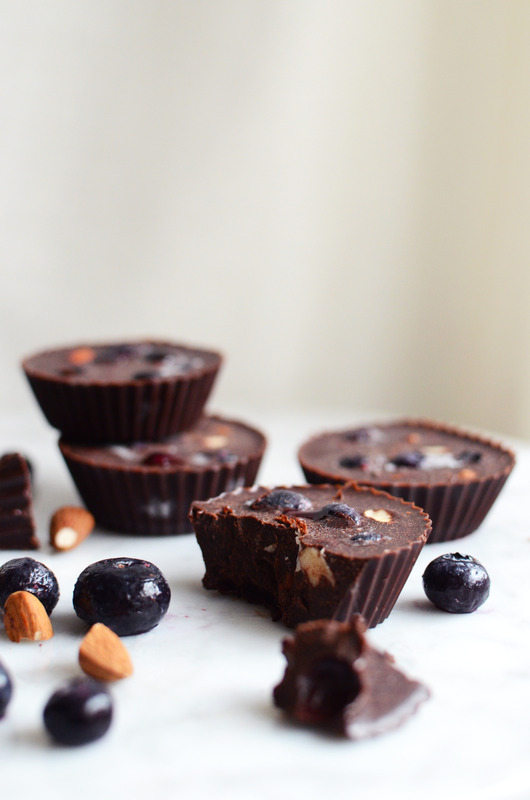 The blueberries are juicy whereas the almonds make the chocolate crunchy. 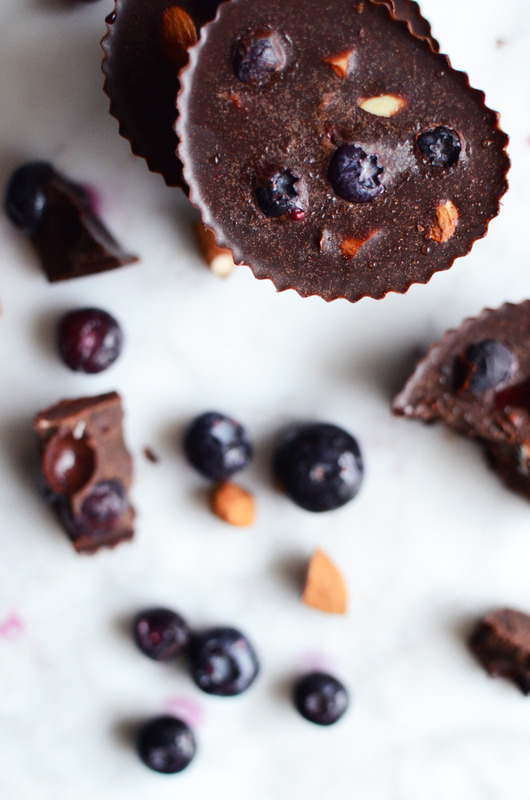 If one of your intentions was to eat more berries for example, these chocolate treats are a rather delicious way for that, if you’re in need of some inspiration. And for the rest of us making our own chocolate might be a good way to figure out those intentions and goals that we want to achieve in the upcoming year. So enjoy your chocolate and have a delicious start to your January! notes: if you want to make a nut-free version, replace the almonds with seeds or dried fruit. to make a vegan version, replace the honey with maple syrup or coconut blossom syrup. 1. Melt the cocoa butter, coconut oil and honey in a small pot on the stove on low heat. Turn the heat off and mix in the cacao powder, vanilla, salt and blueberry powder. Whisk well so that there are no clumps. Taste the chocolate and add more sweetener if you like. 2. 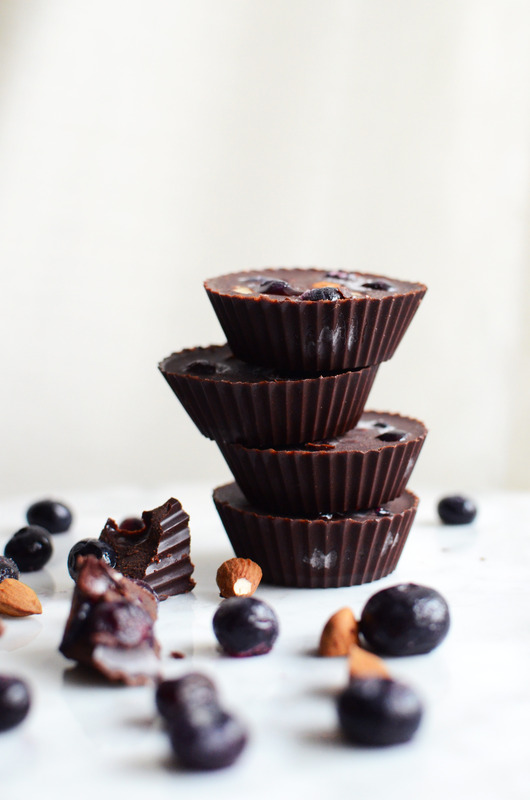 Pour into muffin cups and decorate with blueberries and crushed almonds. Set in the freezer for half an hour or until the chocolate is set. The remaining chocolate (if there is some) can be stored in the fridge. Tagged blueberry, chocolate, rawfood, treats.